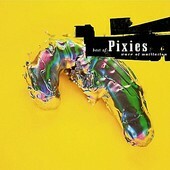 This year was the year of The Pixies. With the seminal, highly influential post-punk outfit reuniting and touring, giving fans something they've been waiting for since 1992 when the band disbanded after only five years. In that time they released the Come On Pilgrim EP and four full-lengths: Surfer Rosa, Doolittle, Bossanova, and Trompe Le Monde. So it is only fitting that 4AD released a companion to Death to the Pixies, The Pixies' best-of record released in 1997 on Elektra Records, this year. Wave of Mutilation: Best of Pixies takes it several steps further, including 23 tracks (Death to the Pixies had 20 tracks, 10 per disc, including disc two's completely live set). Including a majority of songs from Doolittle, long noted as The Pixies' best record, and one of the most influential records of all time. Wave of Mutilation goes in chronological order, including everything from "Gigantic (single version)", "Hey", "Monkey Gone To Heaven", "Debaser", "Wave of Mutilation", and many more. But what makes this record really stand out is the inclusion of a few b-sides, including the live favorite "Into The White", a bass-heavy, stoner-rock-gone-post-punk number that finds Kim Deal's vocals eerily leading you, well, into the white. The record ends with "Winterlong", a Neil Young cover, putting this fitting collection to bed with a duet between Black Francis and Kim Deal, and once again reminding you of the power, vitality, and ingenious of this legendary band. Wave of Mutilation is not cashing in on The Pixies reunion, as some may assume. Rather, it is showcasing the monumental career of this tremendous band, and giving their classics new life with a new track order and pairing, helping you rediscover these songs and their timeless qualities. I'll give it an A.